Sponsored by the famous Standard Chartered banking chain, the Dubai Marathon is a huge event, spread over 4 continents, and inspires thousands of people every year to live healthy lives. The cities which take part in the event include Nairobi, Singapore, Dubai, Mumbai, Hong Kong and Kaula Lumpur. The participants in these marathons have different backgrounds and reasons for taking part. While some are supporting charities, others are testing their physical limits. If you are in Dubai, or any of the participating cities, you can run the marathon or watch it. In this guide we are going to provide you with information on the event, including its history, background, important dates etc. The marathon was first started in 2000 and has been held each year since then. Next year it will be seeing its 16th edition. In its first edition, the men’s winner was Wilson Kibet who took 2 hours, 21 minutes and 21 seconds. In the women’s race, it was Ramilya Burangulova from Russia who took 2 hours, 40 minutes and 22 seconds. There are different kinds of races that take place. 'Fun run', 'Road race' of 10 and 42 kms, and 'corporate challenge' are a few of them. If you’re planning to register for the race, there are a few prerequisites. - Registeration for fun run is open to all but 15 USD will have to be paid as registration fees. - 10 km road race can be registered for by paying 60 USD. But only people over 15 years of age can register. - For the 42.19 km marathon, the registering participant must be 18+ years old and pay 120 USD. The prize money that is given in total to all the winners keeps changing every year. In 2013, it was 500,000 USD for men and 500,000 USD for women. The list with prize money details for the 2015 edition can be seen here. There are timings for all events, including the main marathon, which starts at around 7AM. The dates of the marathon keep changing though, and the 2015 edition is set to be on 23rd January 2015. The management of Dubai Marathon can be contacted on different numbers and email addresses, depending on the nature of your query. 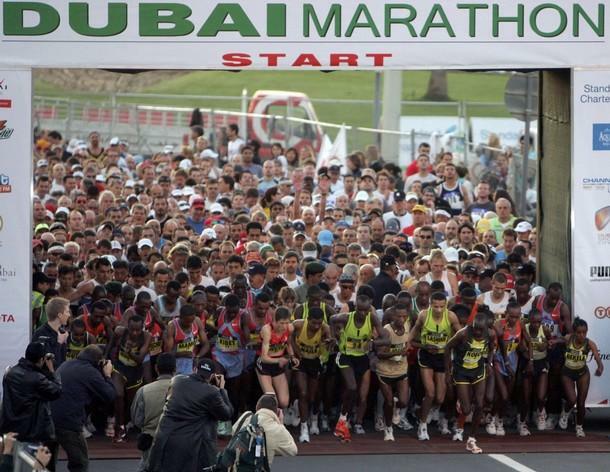 The Dubai Marathon takes place in different areas of Dubai each year. In 2015 it will begin and end on the Umm Suqeim Road opposite the Madinat Jumeirah.